The living fossil, in Darwinian terms, is a marvel of survival. Reported in the Proceedings of the Royal Society B, a discovery on a tropical reef in Palau has enlivened the whole history of bony fish. This beast has a more primitive anatomy than that of any eel fossil. Protanguilla palau; Credit: © Jiro Sakaue, who also discovered the unique fish on the reef, with iridescent fins tipped with white, on a red body, 17.6cm long (7 inches). Researchers from the Smithsonian Institute, Kitasato University in Japan, Chiba Natural history Museum and the Southern Marine Laboratory in Palau itself, find the species endemic to one reef, and to one cave in it, but estimate the larval dispersal phase should ensure quite a wide distribution. As we don't know the larva, or with such an "ancient," whether the larva is normal, that is admittedly a gamble on a really endangered animal. David Johnson, the lead author, described its unique features as "fewer vertebrae, certain fused skull bones, presence of an upper jaw bone found in Cretaceous eels, and toothed gill rakers, which could be involved in feeding and gill maintenance." It looks really different from the eel group, but can be placed right at the start of all things eelish. 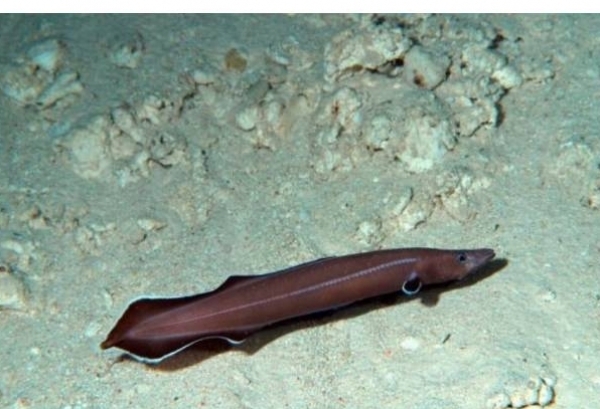 "The eel looks so bizarre - large head with relatively short body and various unique, internal characters - that no ichthyologist, including us, correctly identified it as a member of true eel at first sight," quips co-author Masaki Miya. It's a close sister line, if you like, to the eels with that odd head and a totally independent evolution. The research is unique in that it uses molecular genetics and expert anatomical comparisons to accurately place the eel as the most primitive known. The evolution of these fish is accurately calculated using "relaxed molecular clock" methods, and shows the little fish at 200 million years ago, with "Recent eels," evolving only 100 million years ago. All eels lack pelvic fins and have joined tail and dorsal fins, but there is evidence here of a slight split between dorsal and tail fins. 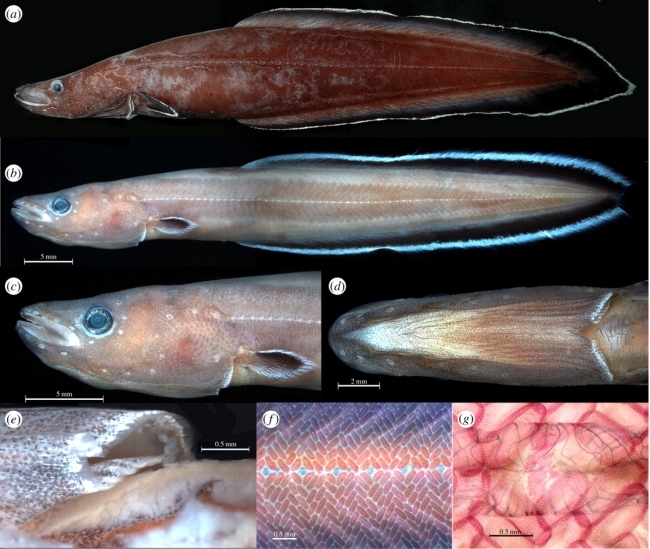 The extremely low vertebrae number of 87 is remarkable and produces a shorter body than most eels, obviously adapted to a unique niche, perhaps lost itself! This relates to a small problem in that the Palau-Kyushu Ridge is only 70 million years old itself, so the fish predates the island. It is only to be hoped that as reefs are pilfered for their fish, more and more of these small species will not be lost, so that we will be unable to piece together important evolutionary movements in fish, arthropods and all the other phyla, some of which themselves have only just been discovered.